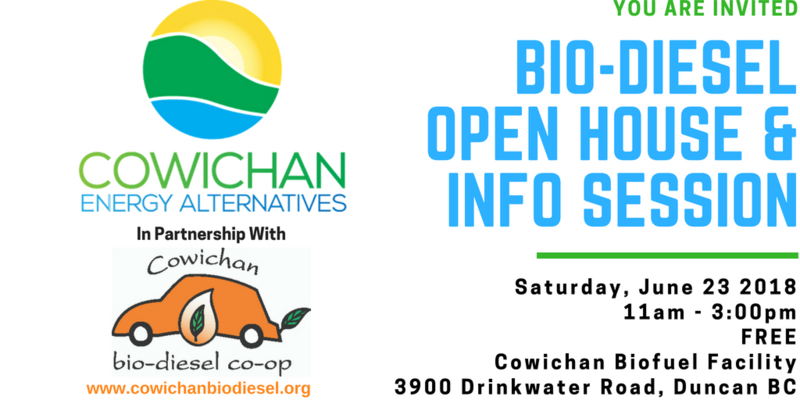 Join us on Saturday June 23, 2018 as we partner with Cowichan Energy Alternatives on hosting our annual bio-diesel event. The event will take place at the Cowichan Bio-Fuel Facility, where CEA's operations team will exemplify its innovative initiative of bio-diesel production made from locally recycled cooking oil collected from Vancouver Island-based restaurants. This is a community event, inviting all to take a tour of the bio-fuel facility, including a free info session, and an opportunity to learn how bio-diesel is a "fill and go" solution in passenger and fleet diesel vehicles and machinery by using our own Green & Go Pump™. The event will take place from 11am to 3pm. For any questions please e-mail our Communications Coordinator. 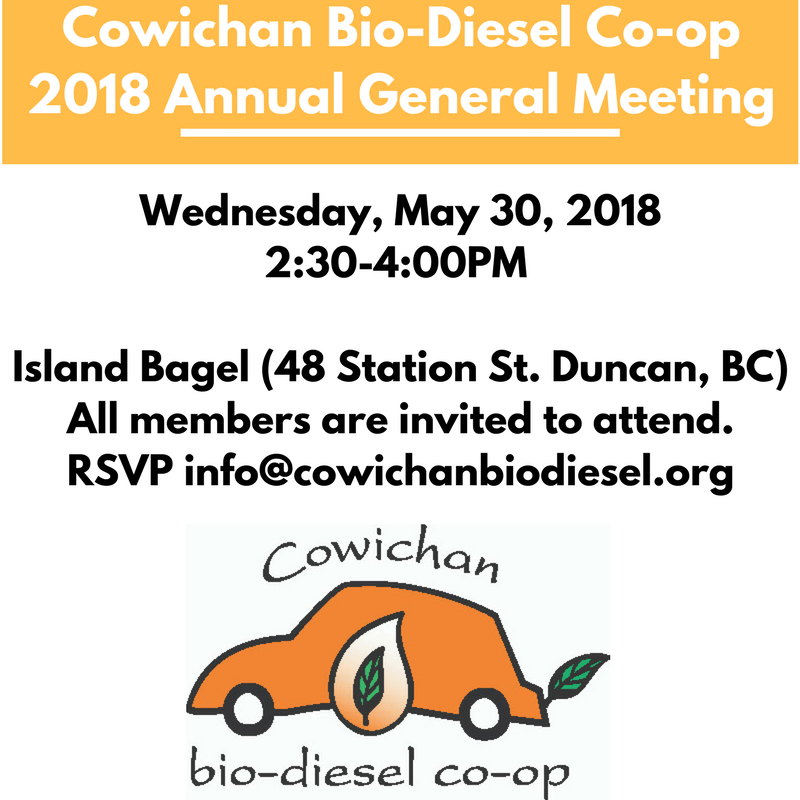 All Cowichan Bio-Diesel Co-op members are invited! All Cowichan Bio-Diesel Co-op Members are invited to the Annual General. This is a great opportunity to discuss this past year's successes and upcoming plans, goals and visions for the next year. ​Meeting on May 30, 2018 at 2:30PM - 4:00PM at Island Bagel's Board Room Meeting. To RSVP please contact our team via e-mail. For those who unable to attend the event in person, proxy vote is accepted, just let our team know. We hope to see as many of our members at this event to connect with one another and reflect. ​Biodiesel in its pure form (B100) can be used as a complete substitute for petroleum diesel fuel or it can be blended with regular diesel at the new Green & Go biofuel station to whatever blend is required (B5, B20 and B50). This makes biodiesel an important renewable energy solution that can be used now with available diesel engine technology to immediately reduce GHG emissions and other harmful pollutants. In North Cowichan where the pump is located, 73% of the community’s GHG emissions are produced by transportation. The sustainable fuel alternative offered at the Cowichan Biofuel Facility, now made even more accessible through the Green & Go Biofuel Station, will enable our community to address one of its biggest environmental challenges. Supporting Sustainability @ Cowichan Station! Most of you are aware of the recent tragic death of CEA and CB-DC financial manager Miles Phillips and the consequential financial difficulties faced by his family. And some of you may be aware of the previous challenges facing the CB-DC (multiple robberies, funding cuts, poor weather forcing closure etc). In light of these events and the spirit of giving, please join us in raising money for the family of Miles Phillips and a cause Miles was passionate about - Cowichan Bio-Diesel Co-op (CB-DC)﻿! There will live music from Bijou de Bayou, Paradigm Shifters, the Twisted Vine String Band, a silent auction, food, beverages, kids activities as well as some fun dance beats spun at the end of the night by Brian Edgar and Federico Vallin. Proceeds will be split between the family of Miles Phillips, and the Cowichan Bio-Diesel Co-op. We are suggesting a donation of $15 at the door, but no one will be turned away for lack of funds or for donating more! Come demonstrate your support and the resilience of our Cowichan community! Cowichan Bio-Diesel Coop is delighted and grateful to have committed members like Genevieve Charbonneau and Stephanie Cerins who have volunteered to organize this event and raise funds for Cowichan Bio-Diesel and Miles's Family. Call 1-855-GREASEY(473-2739) for more details. Cowichan Energy Alternatives and the Cowichan Bio-Diesel Co-Op were proud hosts of the 2011 Collective Biofuels Conference. The CBC brings renewable energy experts, enthusiasts and interested beginners together to discuss all things biofuels, with a focus on biodiesel. Moving the Collective Biodiesel Conference to Canada from Washington D.C. and changing the name to Biofuels seemed risky, but it paid off. Would attendees follow the conference across North America? Could we attract a local base? Thankfully the answer to both was yes. People came from BC and across Canada, ten U.S. states were represented including North Carolina, Texas and Hawaii, and we even had someone come from Iceland! The spirit of the conference was alive and well at this year's event, with a palpable excitement as attendees delved into all aspects of biofuels. Read more about this year's conference at www.collectivebiofuels.org. July 2011 - With the new community biodiesel processor at Bing’s Creek, sustainable vehicle fuel can now be processed in Duncan! The new processor will close the sustainable fuels loop in the Cowichan Valley – taking waste cooking oil from area residents and restaurants, processing it into biodiesel, and selling it at the 2999 Allenby Road card lock in Duncan to CB-DC members. The Grand Opening of the Bing’s Creek Biofuels Facility took place Wednesday, July 27th. This community-scale processor is located at 3900 Drinkwater Road in Duncan. September 2011 Update - We would like to congratulate new Co-op member Maddy Koch on winning 200L of biodiesel with the Big B100 Fuel Giveaway! July 2011 - The Co-op is thrilled to announce that after many years of hard work, fundraising and collaboration, the Cowichan Biofuel Facility is now up and running! In fact, last week CEA processed the first 1000L of locally recycled waste cooking oil into a clean, golden B100. While the facility is still not 100% operational, we now have the ability to better control the quantity and quality of Co-op biofuels for Co-op members – and this will better as we continue to improve and innovate the process! In celebration of this exciting milestone the Co-op would like to reward the members that stood by us through all the growing pains with a Big B100 giveaway!